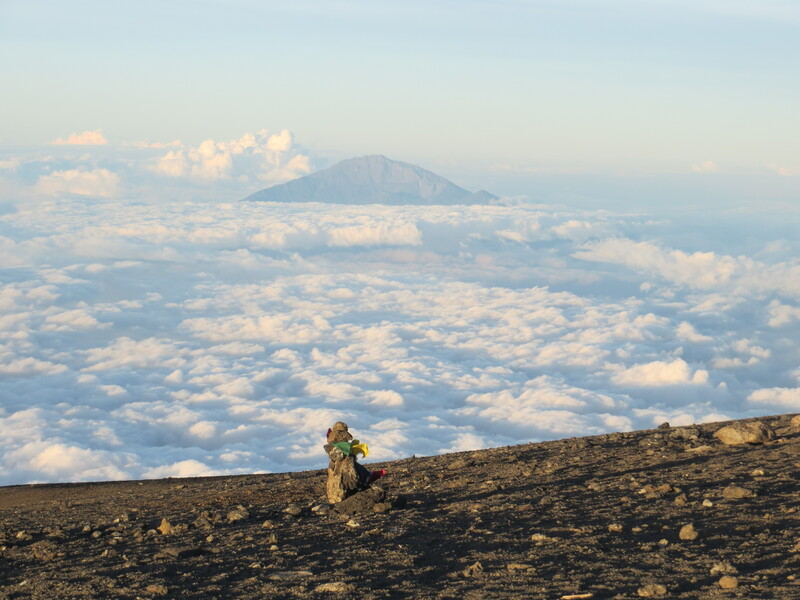 For a little aside, I think I noted previously that the Machame route (which I was on) can be done in six days instead of seven (Lauren and I elected to do the seven-day version). Whereas our day 4 and 5 consisted of short, 3.5 hour climbs, the six-day version of the climb combined those two days into one 7-hour day. It sounds like it’d be fine right… until you realizes that after 7 hours of trekking/climbing, you’d only be getting a short rest before having to get up at 11 PM that evening to begin what should be a 9-hour ascent/descent of the summit… followed by a short rest and a further 4-hour descent… that’s a lot of up and down in 24 hours. 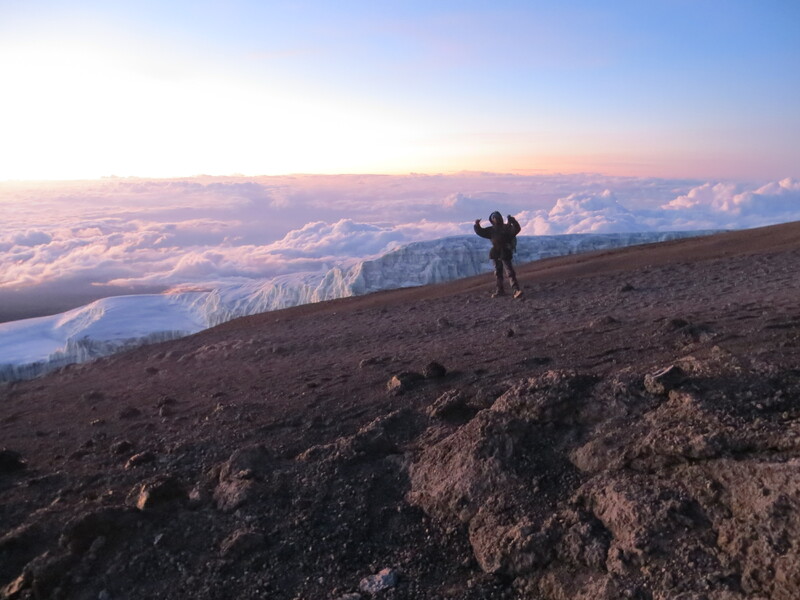 When Lauren and I showed up on the morning of Day 5 to barafu camp, we got to see some of the the six-day folks as they came down from the summit… and let me tell you, the sight was not encouraging. We’d befriended a 40-year oldish German couple as well as a Swiss-German lady (I’d out her at around 55 or so age-wise) on the way up… and they were both doing the 6-day climb (with the same trekking company… remember, no inter-company mixing, and even the intra-company mixing seemed to be frowned upon). We ran into the female half of the German couple first… both her lips and eyes were swollen and blue (literally blue)… she said the summit was he hardest thing that she’d ever done, and the altitude had made her so nauseous that she’d thrown up for times on the way up. Her male counterpart kept mumbling “never again” and noted that he was completely, and utterly spent. No better news from the Swiss-German lady either… although she wasn’t blue anywhere, she noted that it was also the most difficult thing she had ever done (and she has given birth… four times!). And to top things off, on our short acclimatization hike past the camp we saw a 40-year oldish lady being carried down the mountain by four people… her face and eyes also swollen and blue. So, not the most encouraging signs. I think Lauren got a little freaked out… so I reassured her that those folks were older than us, likely not in as good a shape and nowhere near as awesome as we were, so, with the additional day of rest, I doubt that whatever happened to them would happen to us (fingers crossed though). At dinner, Joseph, our guide, came in to give us his usual daily speech about timing and what to expect. He also took a short inventory of what we were likely to be wearing since, with the wind, it was likely going to be very cold. Of course, I was short a couple of items… gloves? A warm hat? A face covering? Additional warm layers? These were things I just didn’t have. I was actually even more unprepared than that, but as luck would have it, when my friend Shayne came out to visit me before my climb, he brought along his cold weather underarmour gear that he still had from his college football playing days… tops and bottoms. I should really ask him why he brought them… but maybe he (or his special lady friend) was thinking about my climb more than I was… anyways, he brought them and gifted them to me the day before he/I left for Kilimanjaro. After our conversation with Joseph, he was nice enough to go out and track down a pair of gloves and a neck covering (albeit a very thin neck covering), and Lauren (who was much more prepared than I was) let me borrow her, relatively thick, headband (you know, the thing that covers your ears but is not a hat). I figured with those things I’d be fine… or at least would be as fine as could be… and that I’d be cold, but live… and live without getting frostbite… inshallah. We hit the tents for a very short rest… and right on time (11:15 PM) one of the porters woke us up with some tea. I honestly hadn’t slept very much because hey… I’m anxious (does anybody sleep well before they have to get up early and do something strenuous, whether it’s a sporting event, or a work meeting, or an early flight?). Plus, since I’d had a bit of headache from the altitude during the day, I’d been downing liters of liquid and was waking up constantly to pee. Despite that, I wasn’t actually very tired… more excited to get going than anything else. So I got up and proceeded to, literally, put on every single piece of clothing I had brought with me… and then some. My inventory… from the bottom up, two pairs of socks (one thick, one thin), underwear, underarmour tights, a pair of jeans, waterproof rain pants, a wife beater, an underarmour long-sleeved shirt, a thermal long-sleeved shirt, a thick wool sweater, a cotton t-shirt, a short-sleeved button up shirt, a rain jacket (an incredible seven layers on top), a scarf, a headband and a bandana. I also had the pair of gloves on that Joseph had found for me and I put the neck covering in my bag. Impeccable timing striking again… the wind had actually died down to almost nothing, so when I got out of my tent feeling like the little brother from “A Christmas Story” I was actually feeling fine (coldwise that is). Off to the mess tent for more tea and some biscuits (cookies to us non-Brits). Joseph came into the mess tent after a bit to get some tea and make sure we were ready… and then we were off. Four of us were making the ascent, Joseph (our guide), Seif (our assistant guide), Lauren and myself. 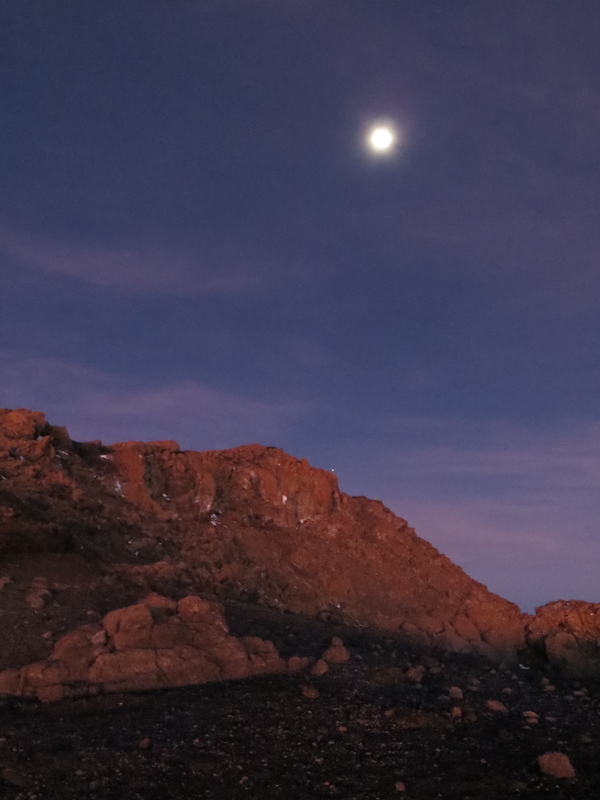 We had all brought headlamps, but there was a full moon up, so we really didn’t need them. We started the ascent at 12:15 am, and managed to easily climb up over the cliff we had done the previous day (12 hours ago anyhow). 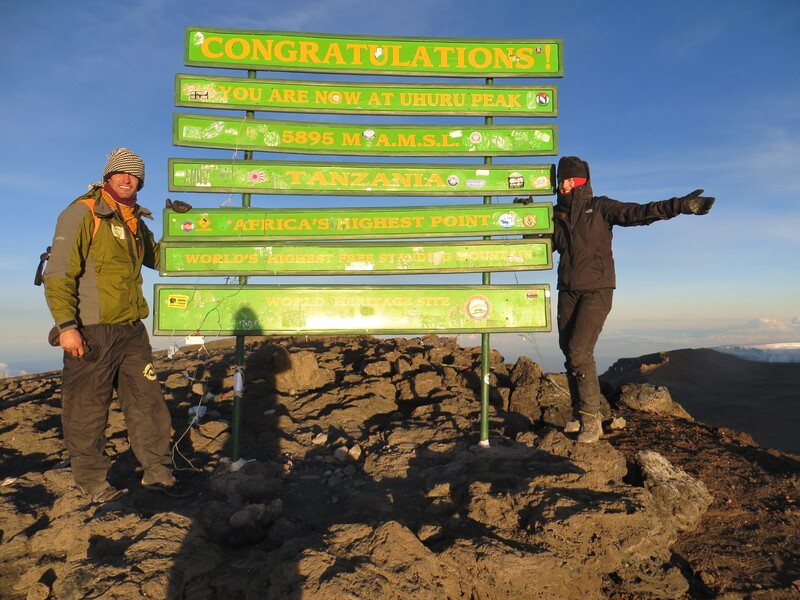 Actually the first 2 and a half hours or so went by pretty effortlessly… all the while going pole pole, slowly slowly in Swahili (we’d stop for 2-3 minutes every half hour or to drink water and catch our breath). It was around 3 am or so that things started to get interesting. The previously slack wind began to roar… and, given where we were, it was a very, very cold wind (and by roar, I mean you had to lean into it while standing). I had to stop and put on my face covering as every piece of exposed skin was now screaming in pain. We kept up or pole pole pace. Except for my face (and fingers and toes of course) I was actually pretty warm… the problems came when we’d stop for our short breaks, as you’d get cold really fast when not moving (another fun fact, the water in our bottles began to freeze, so every sip of water was kind of like drinking a slushee… not that refreshing when it’s already lord knows how many degrees below zero). But we kept on… ever upward… pole pole. The trail was pretty steep… similar to walking up many of the steeper streets in San Francisco… and kept on making small switchbacks up the face of the mountain. By around 5 am or so, we seemed to be just below Stella Point, which was the rim of the crater that forms the top of Kilimanjaro (Kilimanjaro is a dormant volcano, so the top of the mountain has that distinctive used-to-be-a-volcano cone-shaped top that you would imagine would be befitting a dormant volcano). So, after Stella Point, one is basically on the rim of the volcano, and all the real hard climbing is done, although it’s still a (relatively flat) ascent along/around the rim to Uhuru, which is the peak (and about another 45 minutes to an hour away from Stella Point). So, at 5 am or so we could see the top of the ridge, but man oh man, did it seem to take forever to get up to that point…I would definitely say that the last 100 meters or so of vertical ascent was the hardest part of going up. And some, maybe most, of the pain was psychological as you could see how close the ridge was, but going pole pole in the freezing wind makes getting there seem like an eternity. 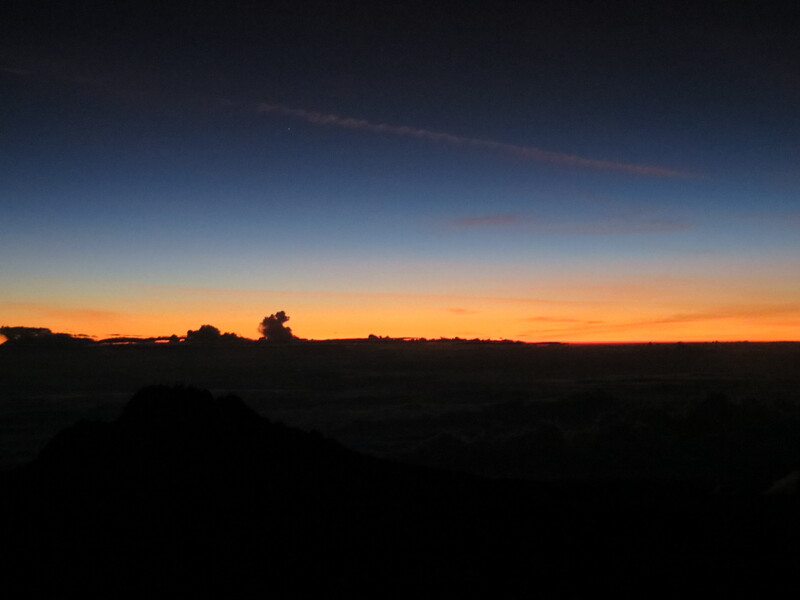 But we eventually got there, and as a reward (visual anyhow) we could look out over the horizon lightening with the approaching dawn. We took a short break at the point, mostly huddled behind a rock trying to hide from the now even more howling freezing wind (note that I’d say there were about 20 other climbers/guides at the point when we arrived… which means some of them must have been sitting there for quite some time as it’s not like there were too many people right in front of us when we hit the ridge… I have no idea why they’d do that as it was so, so cold, and just sitting there is much worse than moving around). Onward and upward again… but at least this time with the beginnings of daylight and at less of incline. 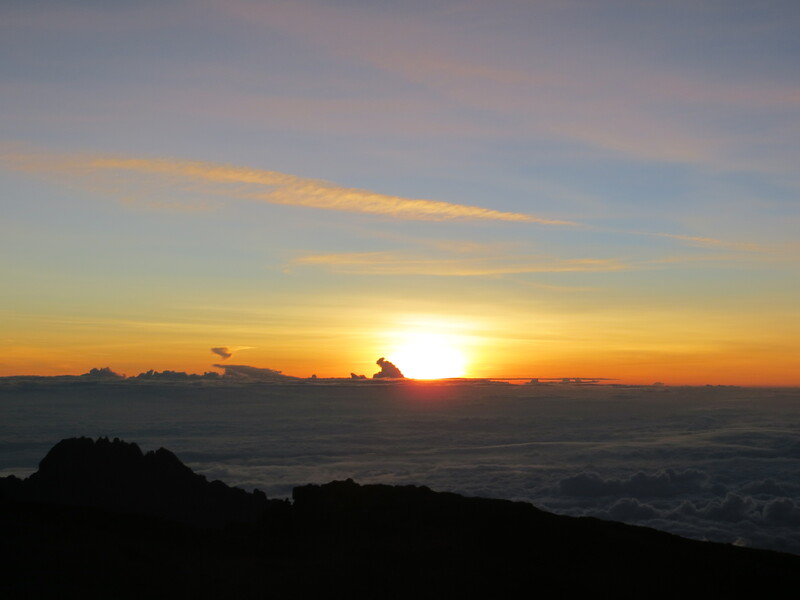 Dawn broke about halfway to Uhuru, and we made it up to the summit at 6:17 am (our guides had to keep track of this for official records). The summit, the landscape, the view, the morning light… it was all quite a spectacular scene, and I would have loved to enjoy the view for a bit more, but it was still f-ing freezing with the wind. I took some photos, but each time I’d take my hand out of my glove it would nearly freeze into the claw like grip I had on the camera in about 30 seconds. I also had another fun factor urging me back down… the beginnings of an altitude induced headache. So after the obligatory photos and some poignant admiration of the view (maybe 5 minutes tops), we started hustling back down. The horizon beginning to brighten from Stella Point. Looking toward Uhuru from across the crater near Stella Point. Dawn breaking on our way to Uhuru. Seif, our assistant guide, hamming it up. Mt. Meru in the distance. Lauren and I at the summit. Bravo Richard and Lauren. I’m impressed. All my time in CA and I’ve never done Mt. Whitney (I’ll put it down on the list)… at least our gear turned out to be good here, but I was a bit worried about hypothermia in Ethiopia. And yes, despite the discomfort, I love trekking and climbing. Thanks for reading.